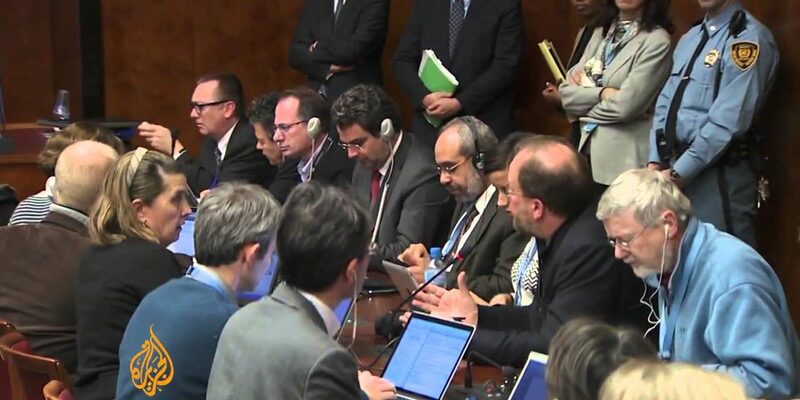 Syria Today, Dec 22: Will There Be a “Peace” Conference in January? Video: The Moment When Regime Killed 50+ Evacuees Near Damascus? Russia declared Saturday that the international conference to resolve Syria’s crisis, scheduled for January 22 in Switzerland, will proceed despite US objections to the presence of Iran. The Russian Foreign Ministry insisted the “main practical achievement” of a meeting on Friday between Russia, the US, and United Nations envoy Lakhdar Brahimi was the confirmation of the date of the conference, reflecting “the awareness of the overwhelming majority of the world that there is no alternative to achieve political and diplomatic settlement of the Syrian crisis”. Brahimi had announced on Friday that, while the participation of more than 30 countries — including Saudi Arabia, the main backer of the insurgents — had been agreed, the US had not withdrawn its veto on the Syrian regime’s ally Iran. Meanwhile, Friday’s US-Russia-UN meeting did not establish how the presence of Syria’s opposition at the meeting would be arranged, given its insistence that President Assad step down as part of any agreement on a transitional government. All matters related to the opposition based abroad are entrusted to the Americans. Russia is coordinating with Syria, the government, the national internal opposition, and part of the external opposition. The point therefore is to let each of the two sponsors of the conference to play its role as agreed. He then condemned the US over its pursuit of that role, notably its attempt at discussions with the Islamic Front, the largest bloc of insurgents inside Syria. The Assad regime has indirectly acknowledged the insurgent capture of its Kindi military headquarters and barracks in Aleppo, calling it a terrorist attack on a hospital. Kindi was converted from a hospital several months ago into a base for regime forces. The attack on al-Kindi university hospital by terrorists, supported by regional, western powers is an attack on the humanity as it offers medical, health services to all cities for free. Al-Kindi hospital is one of the educational hospitals affiliated to the Ministry of higher Education, since its establishment in 2003, it has offered thousands of different medical services to the citizens as it was equipped with the up-to-date medical sets. Ali said the cost of the damage at Kindi is estimated at 1.5 billion Syrian pounds (more than $13 million). State news agency SANA says 20 people, most of them students, were killed on Sunday by a suicide truck bomb near a school in the town of al-Amed in Homs Province. A “military source” said the bomber detonated the truck as classes were being held. SANA also said 12 people, including three children, were killed by insurgent mortar attacks in Daraa in southern Syria. In another claimed victory in their East Ghouta offensive, insurgents have said they killed dozens of pro-regime militia near the Damascus suburb of Doumair. The opposition fighters said they ambushed the regime forces near a military depot. On Thursday, the insurgents said General Mohsen Mousa, the commander of the 156th-Brigade, was slain. Activists circulated photos of his body. Activists, supported by videos, claim regime warplanes killed dozens of civilians in the 9th straight day of airstrikes on and near Aleppo on Sunday. Attacks on the Masaken Hanano neighborhood hit a second-hand market, a two-story building, and a main road. The Aleppo Media Center put the death toll at 32. “The medics say they are removing people in parts; they aren’t sure how many there are,” said Hassoun Abu Faisal, an activist with the AMC. In the town of Marea outside Aleppo, a barrel bomb that exploded near a school used by displaced Syrians killed three members of the same family. Monzer Khaddam, a leading member of Syria’s internal opposition, was released after being held for several hours on Saturday by security forces. Khaddam, who is the executive bureau of the National Coordination Body for Democratic Change (NCBDC), was detained at a military checkpoint in Tartous. Party head Hassan Abdel Azim said “Russian and international pressure” led to Khaddam’s release. Several other members of the internal opposition have been arrested in recent weeks, including the NCBDC’s secretary general Raja Nasser, who was detained last month. On Friday, United Nations Lakhdar Brahimi mentioned the ongoing detention of Nasser, who has been mentioned as a delegate for an international “peace” conference in Switzerland in January. Another party member, Abdel Aziz Khair, disappeared after his arrest in September 2012. The NCBDC condemned Khaddam’s detention as part of a campaign “targeting leaders and members of the National Coordination Body, which calls for a political solution” to the Syrian conflict. The Local Coordination Committees report that 129 people were killed on Saturday, including 19 children and eight women. Of the deaths, 49 were in Aleppo Provicne; 22 in Daraa Province 19 in Quneitra, and 17 in Damascus and its suburbs. More than 100 people have been killed every day since last Sunday, in part because of the regime’s escalation of bombing in and near Aleppo. The Violation Documentations Center has confirmed the deaths of 82,101 people since the conflict began in March 2011. Of the dead, 60,727 were civilians. PreviousSyria Video: The Moment When Regime Killed 50+ Evacuees Near Damascus?